Description: Ringed seals reach about 1.1-1.6 metres in length, weighing 50-100 kg with a weight minimum in May to June and a maximum in autumn. In other words, they are much smaller than Bearded seals. It is virtually impossible to tell the sexes apart. The belly is silver-grey, the sides and the back much darker with a varied pattern of rings, to which this species owes its name. Distribution / Migration: The Ringed seal occurs everywhere in the Arctic inclu- ding the northernmost areas. It is the only arctic seal species that is able to keep a breathing hole open even in thick ice with the claws of its foreflippers. 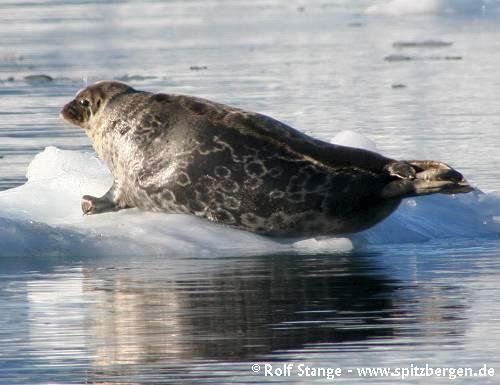 Ringed seals occur in Svalbard waters throughout the year, but mostly near the ice edge north of the archipelago. This seal spends its whole life in or at least near drift ice or fjord ice. As long as the fjords are still frozen, they stay in quite large numbers on the fjord ice. After moulting, which happens in June and July, they retreat to open waters near the ice edge. Observations of Ringed seals, especially good photo opportunities, are quite rare, in contrast to Bearded seals. Biology: Ringed seals can dive several hundred metres deep and spend up to 45 minutes under water, to catch small fish and crustaceans. They give birth in April or May in snow caves on fjord ice. In years with little snow, the seal pup hardly has a chance to survive the first days. The pup is white, about 60 cm long and weighs 4.5 kg. It spends six weeks with its mother, half of this time in the water, and will reach a weight of 20 kg during this nursing period. The female will mate again when the pup is about to become independent, but it takes another four months until pregnancy actually proceeds with the development of the fertilized egg. Miscellaneous: The Ringed seal is the most abundant arctic seal species; the global population is estimated at several million individuals. They are the preferred meal of Polar bears, but Greenland sharks and occasionally Walrus may also take a Ringed seal. New-born pups may fall victim to Arctic foxes or Glaucous gulls, if snow is lacking to hide in. Man has hunted Ringed seals in their thousands and is still doing so everywhere in the Arctic; in Svalbard it is possible for the locals to hunt Ringed seals outside the protected areas and the breeding season. Catches are actually low, whereas this is a main target species for hunters in Greenland. The meat is mainly used as dog food, but also for human consumption. If a Ringed seal escapes from all these dangers, it may well become several decades old.